1- Manchester City still the best: Champions City may have lost their third Premier League game in over sixty matches, but they are still the benchmark. The authority with which they dominated Chelsea in the opening 43 minutes, before Ngolo Kante’s opener on the stroke of half time has never been witnessed before. In addition to pace, speed of thought and high football intelligence, City are excellently structured to win possession high up the pitch. This puts pressure on even the best drilled teams. 2- Sarri-ball on correct tangent: Maurizio Sarri’s biggest call in masterminding an unexpected victory over Manchester City was to drop orthodox number nines Olivier Giroud and Alvaro Morata in favour of three amigos. Chelsea gained much more traction with Eden Hazard operating as a false nine flanked by Pedro and Willian than they would have got from Giroud and Morata. Though Hazard stopped short of excelling, he set up the go ahead goal and helped prevent City’s central defenders from playing out of the back. 3- Pep bungled his lines: Pep Guardiola made a monumental error by failing to field any proper centre forward. In Sergio Aguero’s place, the Catalan should have started Gabriel Jesus to keep Chelsea’s suspect central defense of Antonio Rudiger and David Luiz under more pressure. The absence of an Orthodox forward allowed Luiz to make marauding runs into City’s half. 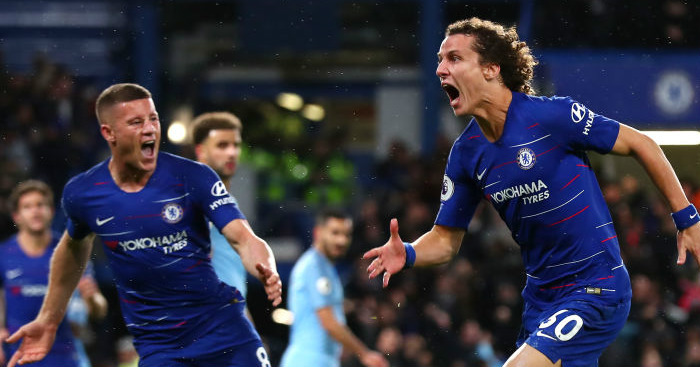 Long before he netted the header that put an icing on Chelsea’s victory, Luiz was playing almost as an auxiliary midfielder because he was not properly occupied defensively. 4- Kante thriving in advanced role: French World Cup winner Ngolo Kante played his best football since being moved into a more advanced role to accommodate Jorginho’s tempo making. In addition to scoring the all important breakthrough goal, he made numerous forays into the City box. Hadn’t Willian and Pedro left their shooting boots home, Kante could have registered as many as two assists. 5- Chelsea short on pace, power: Among City’s principal advantages over opposition teams, is the ability to move from first to third gear in a blink of an eye. Raheem Sterling, Leroy Sane and Kyle Walker are among the fastest players in the division. Chelsea’s January and summer recruitment should therefore centre on bringing in a centre forward and improving the team’s pace and power in wide areas. 6- City’s reaction to going behind poor: Ngolo Kante’s opener was only the third time in more than five dozen matches that Manchester City have fallen behind before halftime. The champions’ subdued second half response, in which Chelsea could have extended their lead long before Luiz’s header, suggests a lack of leadership on the pitch. Point noted for EPL teams: Any team hoping for a result against the champions must score first. 7- Sarri psychologically sisarmed City: Maurizio Sarri’s response to a journalist’s question:”How does one beat Manchester City?” was one for the ages. By replying, “I don’t know. Ask someone else,” Sarri hit two birds with one stone. First, he kept his game plan close to his chest; forestalling any counteractive move Pep Guardiola may have conjured up. Secondly, he lured City into a false sense of invincibility that Chelsea eventually preyed upon.